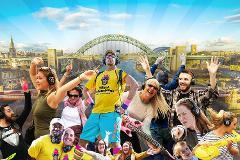 It's a Flash Mob, it's a Silent Disco, It’s a roaming, rhythmic riot through Newcastle! Join the Silent Adventures Team as we take you on a journey of song and dance through the famous streets of Newcastle. This musically instructed adventure aims to have your funky moves on display and your pop star voices serenading the people of the capital! Hi-tech headsets will fill your body with beats, theme songs and your favourite hits across the decades. As your inhibitions evaporate and laughter takes over, you will be part of the best all dance, all singing walking tour in town! Please make sure you arrive inside the ground mall of the Gate Centre 15 minutes ahead of the tour where you’ll be given your headphones and taken to the starting point.